All aboard the Cash Cruise! Click here to play! You'll be taking on the roll of a high profile gambler at the poker table in this adventure on the water. If you're the last one standing in this game of cards, you'll be taking home a major pot! As a high roller, you'll have plenty of women hanging off your arms, but you'll want to seek the attention of the beautiful brunette in this game as she acts as a substitute. Not only will she substitute for all other symbols, excluding scatters, but also if you spin two to five of her across a pay line you could win up to 5000 times your line bet. As the object of poker is to collect the most chips, you'll want to spin the poker chip across the reels to really bring in the money. Two to five of these symbols will get you up to 2500 times your line bet. There are also cards, disco balls and the boat captain to help you in your game. You can't have a cruise without a ship, and this ship is extra special. It acts as a scatter. Spin two to five of these anywhere on the board and you'll multiply your total bet. If you spin three or more you will trigger a bonus feature that will see you winning even more money. So, board the Cash Cruise for a chance to become a high roller! The cruise ship acts as a scatter symbol. Spin two or more anywhere on the board and you could receive 2, 5, 15 or 100 times your total bet respectively. Spin three or more to trigger the bonus feature. The beautiful brunette acts as a wild symbol. Spin two to five of this enchanting gal and you could get up to 5000 times your line bet. She also substitute for all other symbols excluding scatters. 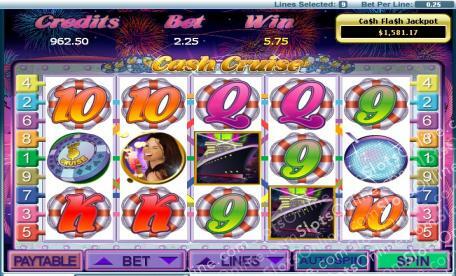 The cruise ship triggers the bonus feature if you spin three or more anywhere on the board. During this game, the ship icons will cover the board. Choose five out of nine with the aim to get three of a kind. If you do, you will be rewarded with a bonus prize!